Let’s look at the backdrop first. NCHR was a nonprofit organization whose programs defended and promoted the rights of Haitian refugees as well as Haitian Americans. It also supported human rights in Haiti. In 1999 NCHR ran a campaign for the rights of children in Haiti, with special attention to rèstavèk, children whose destitute parents sent them to better-off families in towns and cities in hopes of a better life for them. In fact, the children usually became domestic slaves with no opportunity to go to school, and many were abused. 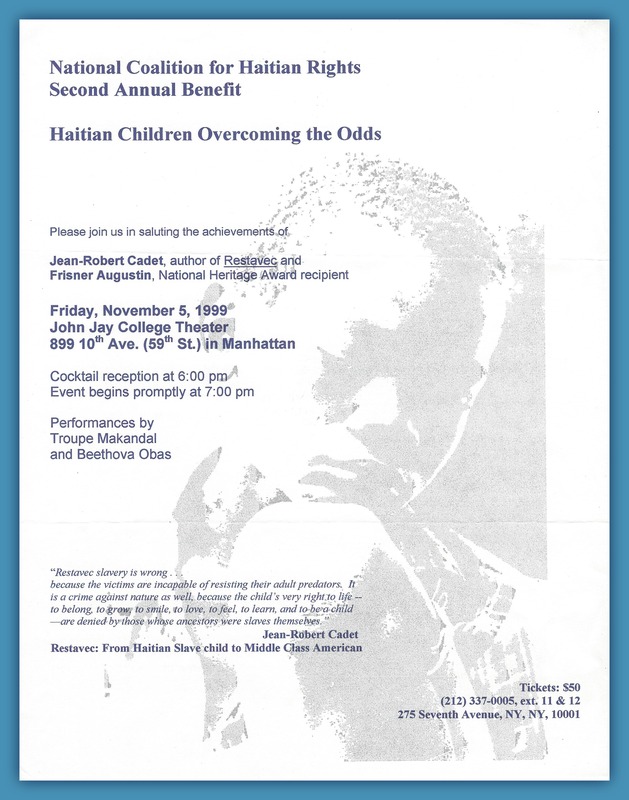 NCHR planned to present at its annual fundraising gala the testimony of Jean-Robert Cadet, a former rèstavèk who had made his way to the United States and written a book about his experiences (Restavec: From Haitian Slave Child to Middle-Class American, University of Texas Press, 1998). Frisner didn’t know anything about Cadet or the NCHR’s gala when he arrived at TGIT that summer evening. McCalla had invited him as the week’s featured guest, a Haitian artist who had won a distinguished national honor, and so Frisner arrived with his drum and entertained the gathering with selections from the Afro-Haitian repertoire. When he was done performing, his listeners drew him into their circle. Johnny, who was just getting to know Frisner, plied him with questions about his life in Haiti. Frisner never hid the details of his childhood struggle: the one-room shack behind the cemetery; the dirt-floor bed; the hustle to earn a few cents however you could so that the family might eat tonight; and the taunts of the children who were in school—because you weren’t. Johnny must have pondered the distance Frisner had traveled, from the one-room shack to the halls of Washington, DC, where he would receive his Fellowship in September. The story carried a message not unlike that of Cadet’s. No, Frisner was never a rèstavèk, but the brutal poverty into which he was innocently born nonetheless stripped him of such basic human rights as food, proper shelter, and education. As Frisner explained that night in NCHR’s office, he did the only thing he could in his situation: he used what he had, namely, his musical talent to lift him up out of his struggle. It seemed natural to invite Frisner to play at the annual gala, and to honor him along with Jean-Robert Cadet. The audience heard the story on the evening of November 5 when NCHR produced its gala at the John Jay CollegeTheater, an appropriate choice given the venue’s mission to present art focusing on justice. 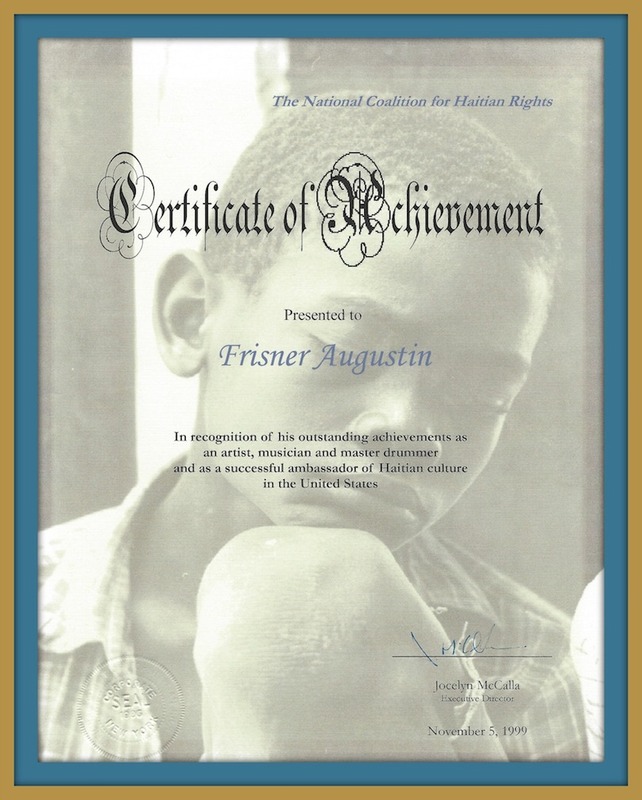 NCHR called its program Haitian Children Overcoming the Odds. Author Edwige Danticat introduced Frisner, and Johnny McCalla presented the Certificate of Achievement, noting beforehand Frisner’s outstanding t-shirt: a scintillating creation of artist Kesler Pierre that, on its own, marked the triumph of the Haitian imagination. Perhaps the best part of the ceremony was Frisner’s identification of the drum as his diploma. Just as a diploma becomes a graduate’s passport to a profession, so the drum served as his passport out of poverty and on to a career as a master drummer. See the video below for Johnny’s presentation, Frisner’s acceptance speech, and a performance by Makandal. Some dozens of stories are emerging from the Frisner Augustin Memorial Archive. To learn about the project, become part of the team through a tax-deductible contribution, and maybe even contribute a document of your own, please visit our Archive page. We look forward to your participation. We send a special thank you and shout-out to Johnny McCalla for finding and donating the featured video by Michele Stephenson. Featured image: Detail from Marasa vèvè (sacred diagram) by Kesler Pierre. In the pantheon of Haitian Vodou the Marasa represent the power of children. 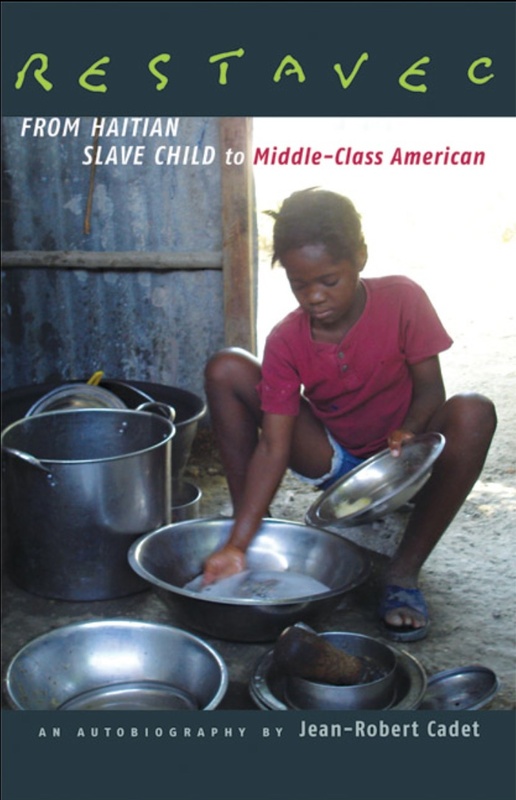 Front cover of Restavec: From Haitian Slave Child to Middle-Class American, an autobiography by Jean-Robert Cadet. Video shot by Michele Stephenson and edited by Lois Wilcken, with excerpts from Jocelyn McCalla’s presentation of Mr. Augustin’s Certificate of Achievment, the latter’s acceptance speech, and the performance by La Troupe Makandal. Performers (from the left): Donald Etienne, bell; Kesler Pierre, bass drum; Jimmy Deats, rattle; Jonathan Blume, third drum; Steve Deats, second drum; Frisner Augustin, lead drum; Sandy St. Cyr (not seen in this excerpt), vocals. This entry was posted in Tales from the Archive and tagged Archive, Drumming, Drums, Frisner Augustin, Haiti, Haitian, Haitian Children, Haitian Music, National Coalition for Haitian Rights, NEA Heritage Fellowship. Bookmark the permalink.